Some tenants were taught a bitter lesson by their landlord who reportedly sent soldiers to flog the hell out of the them. 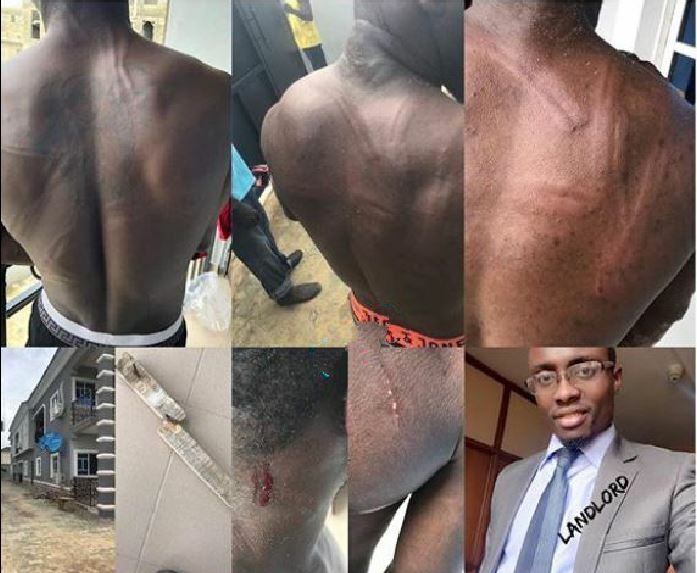 Three tenants were left in a sorry state this morning after they were reportedly flogged mercilessly by soldiers at Lekki Palm City Estate, Ajah. It was gathered that the soldiers acted on the orders of their landlord, one Majuka Nnamdi Emmanuel. Trouble reportedly started after a tenant identified as Ayo, demanded for a refund of his N1.3m rent, following a robbery attack on his house, just days after moving in, a report by Instablog stated. He allegedly reported the robbery case at the Alagbon police station but nothing came out of the investigation. Feeling unsafe, he contacted the agent for a refund of the remainder of his rent, asking him to deduct the cost of the days he had spent in the house. The agent delivered the message to the landlord, but Majuka refused, insisting that he can’t get a refund except someone else moves in and then he can partly refund Ayo. The argument for a refund went on for some time. However, to the surprise of the tenants, they woke up today to the presence of their landlord and some soldiers who ordered them out and beat them mercilessly. 0 Response to "Tenants Flogged Mercilessly After Landlord Mobilized Soldiers To Teach Them A Lesson (Photo)"